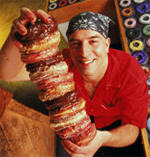 Next time you visit New York City, don’t forget to visit the Doughnut Plant. Apparently, the egg-free, transfats-free doughnuts are not only fabulous, but also spiritually surcharged. What more could you ask for?